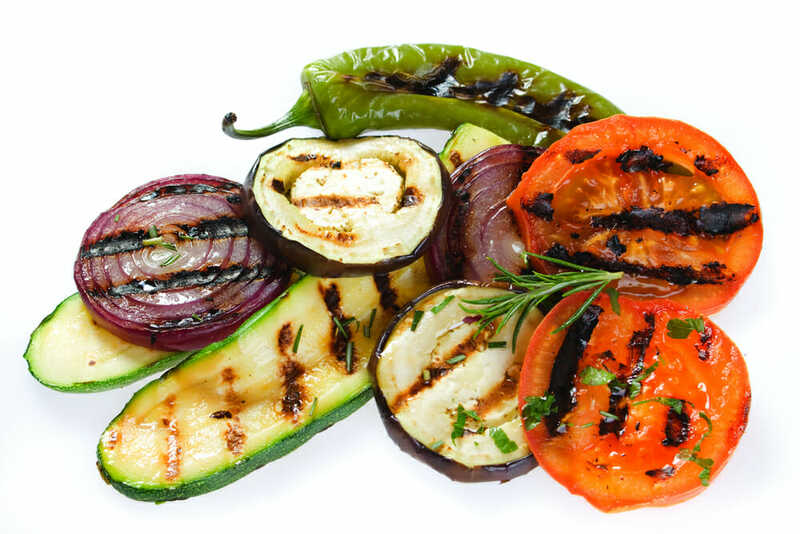 Grilling fresh vegetables and fruits without oil is the healthiest way to enjoy a healthy BBQ. It?s also an easy way to add natural, mouthwatering flavor to foods without risking your health. Vegetables don?t need oil to prevent them from sticking to the grill. ?You can use lemon or lime juice or other marinades instead. You can also use a grill basket or kabob skewers to prevent veggies from falling through grill grates. ?Grill pans or plates are another way of grilling foods on the grill or in your kitchen. If it rains or you don?t have an outdoor grill, you can use an oven broiler. Like a grill, the broiler uses intense heat that comes from one side. The main difference is a grill?s flame is below, and a broiler?s heat comes from above. Preheating the grill is important because it?s the only way to get perfect grilling marks. Tip: Don?t move the food until you can see it?s getting grill marks. Marinating creates delicious flavors, but be wary of store-bought dressings and sauces. They can be loaded with sugar, bad oils, gluten, and other unhealthy ingredients. Instead, make your own simple blends with ingredients such as vinegar, citrus, and herbs. You may enjoy this?2-Minute Oil-Free Balsamic Dressing. Though it might not be at every summer party, cauliflower is one food worth considering adding to your healthy BBQ menu. Cauliflower is a cruciferous vegetable ? and cruciferous vegetables?haveextraordinary?anti-cancer and antidepressant benefits, as well as being cardioprotective and packed with antioxidants. Grilled cauliflower ?steaks? are an impressive and appetizing main or side dish. Cut the cauliflower by slicing the entire head, from top to bottom (one head of cauliflower will yield three thin or two thicker pieces). Marinate with ingredients, such as za?atar spices, garlic, and lemon juice, for at least one to two hours. And then, cook over medium heat on each side for five to seven minutes and sprinkle with fresh herbs to serve. The result is tender and slightly sweet, with a hint of smokiness. You can also try these?Grilled Cauliflower ?Steaks? with Spicy Lentil Sauce?from Rebecca Mastoris from Live Earth Farm. One important note: Cauliflower is nutritious and can be yummy, but it doesn?t have a lot of protein and won?t be filling on its own. So if you do serve this as a main dish, make sure to serve protein-packed sides with ingredients, such as lentils, beans, nuts and seeds, and quinoa.